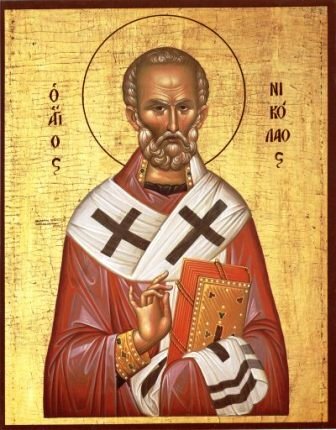 There was a certain formerly rich inhabitant of Patara, whom St Nicholas saved from great sin. The man had three grown daughters, and in desparation he planned to sell their bodies so they would have money for food. The saint, learning of the man’s poverty and of his wicked intention, secretly visited him one night and threw a sack of gold through the window. With the money the man arranged an honorable marriage for his daughter. St Nicholas also provided gold for the other daughters, thereby saving the family from falling into spiritual destruction. In bestowing charity, St Nicholas always strove to do this secretly and to conceal his good deeds. When he reached the ancient city of Jerusalem and came to Golgotha, St Nicholas gave thanks to the Savior. He went to all the holy places, worshiping at each one. One night on Mount Sion, the closed doors of the church opened by themselves for thegreat pilgrim. Going round the holy places connected with the earthly service of the Son of God, St Nicholas decided to withdraw into the desert, but he was stopped by a divine voice urging him to return to his native country. He returned to Lycia, and yearning for a life of quietude, the saint entered into the brotherhood of a monastery named Holy Sion, which had been founded by his uncle. But the Lord again indicated another path for him, “Nicholas, this is not the vineyard where you shall bear fruit for Me. Return to the world, and glorify My Name there.” So he left Patara and went to Myra in Lycia. Even during his life the saint worked many miracles. One of the greatest was the deliverance from death of three men unjustly condemned by the Governor, who had been bribed. The saint boldly went up to the executioner and took his sword, already suspended over the heads of the condemned. The Governor, denounced by St Nicholas for his wrong doing, repented and begged for forgiveness. Witnessing this remarkable event were three military officers, who were sent to Phrygia by the emperor Constantine to put down a rebellion. They did not suspect that soon they would also be compelled to seek the intercession of St Nicholas. Evil men slandered them before the emperor, and the officers were sentenced to death. Appearing to St Constantine in a dream, St Nicholas called on him to overturn the unjust sentence of the military officers. The first Russian Christian prince Askold (+ 882) was baptized in 866 by Patriarch Photius (February 6) with the name Nicholas. Over the grave of Askold, St Olga (July 11) built the first temple of St Nicholas in the Russian Church at Kiev. Primary cathedrals were dedicated to St Nicholas at Izborsk, Ostrov, Mozhaisk, and Zaraisk. At Novgorod the Great, one of the main churches of the city, the Nikolo-Dvorischensk church, later became a cathedral. Famed and venerable churches and monasteries dedicated to St Nicholas are found at Kiev, Smolensk, Pskov, Toropetsa, Galich, Archangelsk, Great Ustiug, Tobolsk. Moscow had dozens ofchurches named for the saint, and also three monasteries in the Moscow diocese: the Nikolo-Greek (Staryi) in the Chinese-quarter, the Nikolo-Perervinsk and the Nikolo-Ugreshsk. One of the chief towers of the Kremlin was named the Nikolsk. Many village churches in Russia were dedicated to the wonderworker Nicholas, venerated by peasants as a merciful intercessor before the Lord for all the people in their work. And in the Russian land St Nicholas did not cease his intercession. Ancient Kiev preserves the memory about the miraculous rescue of a drowning infant by the saint. The great wonderworker, hearing the grief-filled prayers of the parents for the loss of their only child, took the infant from the waters, revived him and placed him in the choir-loft of the church of Holy Wisdom (Hagia Sophia) before his wonderworking icon. In the morning the infant was found safe by his thrilled parents, praising St Nicholas the Wonderworker. Many wonderworking icons of St Nicholas appeared in Russia and came also from other lands. There is the ancient Byzantine embordered image of the saint, brought to Moscow from Novgorod, and the large icon painted in the thirteenth century by a Novgorod master. Two depictions of the wonderworker are especially numerous in the Russian Church: St Nicholas of Zaraisk, portrayed in full-length, with his right hand raised in blessing and with a Gospel (this image was brought to Ryazan in 1225 by the Byzantine Princess Eupraxia, the future wife of Prince Theodore. She perished in 1237 with her husband and infant son during the incursion of Batu); and St Nicholas of Mozhaisk, also in full stature, with a sword in his right hand and a city in his left. This recalls the miraculous rescue of the city of Mozhaisk from an invasion of enemies, through the prayers of the saint. It is impossible to list all the grace-filled icons of St Nicholas, or to enumerate all his miracles. St Nicholas is the patron of travelers, and we pray to him for deliverance from floods, poverty, or any misfortunes. He has promised to help those who remember his parents, Theophanes and Nonna.